Do you think that blogs for medicine are boring? The blue theme of WordPress BeHealthy will change your mind. Its stunning appearance includes multi-level menu and horizontal menus on a bright blue background. The fist thing that visitors will see on your page is the slideshow you will arrange as an introduction to your site. Use your imagination and style to add the most outstanding images and texts in the interactive part of your site. Take advantage from the abundance of instruments and tools for configuration of your blog to make it more appealing and unique. The main part of the site is the valuable content; therefore make sure you use the abundance of formatting possibilities in every blog posts that you are going to add. The opportunity to categorize the content makes it easy for you, and for your readers to find what they are looking for. Do you want to know what the audience thinks for your site? Get feedbacks and opinions on each post and provide an effective contact page on your blog. The social networks are real boasters for the interesting websites, so don’t miss out to use the social share bar to connect your audience. 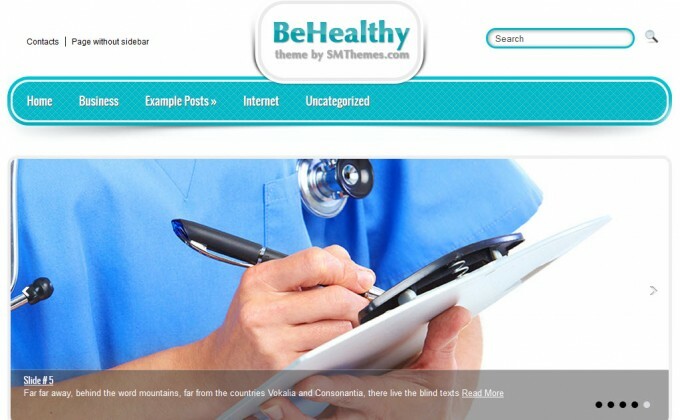 BeHealthy is a responsive theme that automatically adjusts to all kinds of desktops, screen sizes and resolutions, laptops and tablets.